NARI names Knight MN Contractor of the Year | Knight Construction Design Inc. The exterior project added curb appeal and accessibility to a home with a daughter who has been confined to a wheelchair most of her life. It featured a covered entry and ramp with decorative metal railing. A tall, side garage addition on the corner lot suits the family’s handicap van. And the new roofline enhances curb appeal. The winning master suite his/hers luxury baths delivered the clients’ desired floor plan and quality fixtures despite demanding site challenges (such as demolishing the poured concrete, rebar-reinforced sunken spa tub to make room for the new drop-in air bubble bath. Special care was taken to salvage and match custom millwork and preserve the former fixtures for resale. Gary commended Designer Kristen Peck and Project Manager Jeff Harrison for their award-winning work. 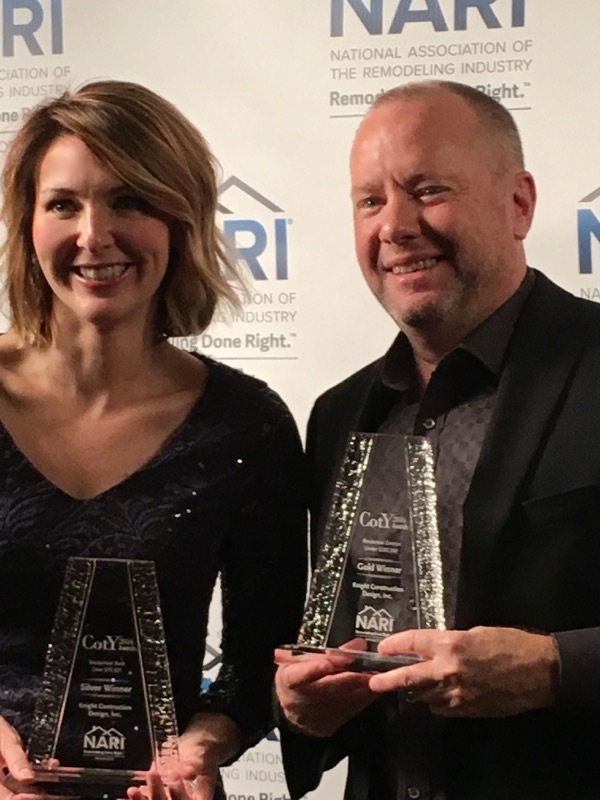 Gary and Kristen accepted the awards at the NARI MN CotY Awards Gala attended by more than 300 remodeling industry colleagues at International Market Square on Nov. 17, 2016. Minnesota remodelers entered 89 projects in 26 categories this year. Knight Construction Design won the national CotY title for best entire house remodeling $250,000-$500,000 last year.